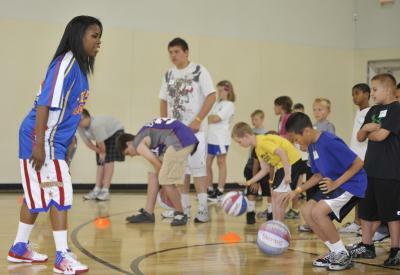 Everyone loves The Globetrotters, the stars who always put smiles on kids’ faces. At Globetrotter Summer Skills Clinics, our stars coach kids in limited size groups and bring laughs, encouragement and high fives for everyone! Globetrotters direct, motivate, inspire AND entertain, keeping it inclusive and fun for ALL boys and girls, aged 6-12, of ALL skill and experience levels. Each session is $59 and includes a free ticket voucher to see the Globetrotters live in 2014! But you can save $10 with promo code USFAMILY! Code is valid through 5/31. disclosure~this is a sponsored post~ my family and I will receive 4 tickets Vouchers valid for any Globetrotter Game for the 2014 Season.